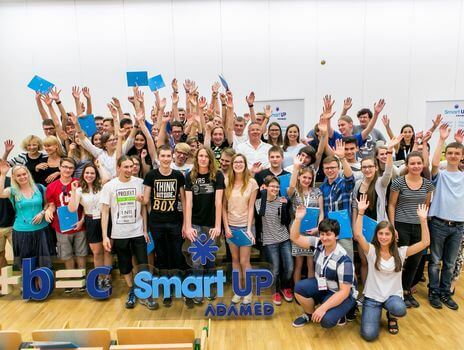 The second ADAMED SmartUP science camp came to its end. For two weeks, a group of 50 young exact science enthusiasts expanded their knowledge and conducted experiments with the assistance of distinguished lecturers from Polish and foreign universities and research centres. The participants of the camp were divided into four subject groups: chemistry and biochemistry; medicine and medical sciences; engineering and robotics; and physics and new technologies. The classes took whole days and the scientific discussions often lasted until late in night. The lectures conducted by great scientists were intermixed with tests and experiments performed in well-equipped laboratories. For most students it was their first contact with advanced research equipment. There were also many trainings in public speaking or workshops in cooperation and team work, accompanied by numerous trips to renowned science institutes. Thanks to the cooperation with the Institute of Automatic Control and Robotics and Mechanical Faculty of Power and Aeronautical Engineering at the Warsaw University of Technology, the participants met the members of the Student Astronautical Club and Student Propulsion Association MELprop. The young people also attended practical classes in an aerodynamic tunnel and flight simulator. “The order of classes was intended to comprehensively support the development of interests of these talented persons, and at the same time to provide them not only with knowledge but also with soft skills, such as team work – which are equally necessary to pursue a scientific career,” said Anna Kosińska, ADAMED SmartUP Programme Manager. Several thousands of middle and high school students sought admission to the camp by participating in a multistage recruitment, which included an innovative alternative reality scientific game online, a scientific test and recruitment meetings with the Scientific Council of the Programme. 10 from among 50 persons who succeeded in the qualification process and participated in the camp will become the laureates of this year’s edition of the ADAMED SmartUP. They will be awarded 10-month individual educational tutoring programmes tailored to their needs and research-related dreams, and the selected ones will receive a scholarship. The laureates of the last year’s edition of the programme had a real hands-on experience of how important this can be. Thanks to their mentors’ support, they won first prizes in national and international Olympiads, commenced studies at the best universities in the world, or had the opportunity to carry out individual research projects. View the camp photo gallery available here.